This guide will walk you through all of your options within the Profile page. Once logged in, click on the profile tab in the top right of the screen. You’ll notice several tabs to explore in profile page. First tab is the run environments. This is your main segment for creating connection profiles. Second tab is groups where you can create group and add members to it. Next section is the SSH Keys, where you can create new or enter existing SSH key pairs to establish connection to any kind of host. Fourth tab is called Amazon Keys where you enter your Amazon Web Services (AWS) security credentials to start/stop Amazon EC2 instances. Before creating run environment, SSH Keys needed to be created in SSH Keys tab. If you want to create Amazon EC2 instances and submit your jobs to Amazon Cloud, then both SSH and Amazon Key are required before specifying run environment. In the SSH keys tab, you can create new or enter existing SSH key pairs by clicking on “Add SSH Key” button. By using Add SSH Keys window, enter the name of your keys and select the method you want to proceed: A. Use your own keys or B. Create new keys. You will be prompted to supply a filename and a password. In order to accept the default filename (and location) for your key pair, press Enter without entering a filename. Your SSH keys will be generated using the default filename (id_rsa and id_rsa.pub). In both of the cases, private key will be used for submiting jobs in the host. Therefore, public key required to be added into ~/.ssh/authorized_keys in the host by user. 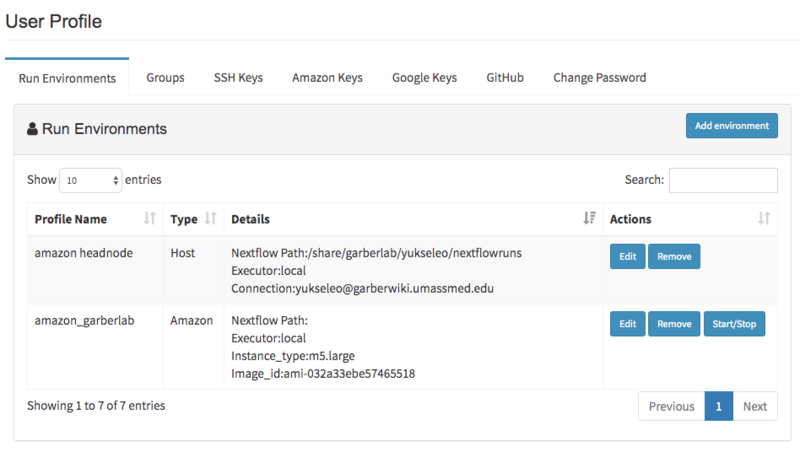 cat ~/.ssh/id_rsa.pub | ssh USERNAME@HOSTNAME "mkdir -p ~/.ssh && cat >> ~/.ssh/authorized_keys"
In the Amazon keys tab, you can enter your AWS security credentials (access key, secret key and default region) by clicking on “Add Amazon Key” button. Your information will be encrypted and kept secure. You will only have full access to editing and viewing the key information. Groups tab is used to create groups by clicking on “Create a Group” button. After creating group, you can add members by clicking Options > Add User button. By using this group information, you can share your process, pipeline or projects with group members. In order to see current members of the group, you can click Options > View Group Members button. You can also delete your group by clicking Options > Delete Group button. This section is used for defining connection profiles by clicking on “Add Environment” button. Type options (A. Host or B. Amazon) will be prompted to user. You may choose “Host” option, if you are planing to submit jobs to specified hosts by using SSH Keys, or you may proceed with “Amazon” option to create Amazon EC2 instances and submit your jobs to Amazon Cloud. Username/Hostname: You should enter your username and hostname of the host which you would like to connect. For instance, in order to connect us2r@ghpcc06.umassrc.org, you would enter us2r as username and ghpcc06.umassrc.org as hostname. You don’t need to add @ sign while entering this information. SSH Keys: are saved in SSH keys tab and will be used while connecting to host. Executor of Nextflow/Executor of Nextflow Jobs: You can determine the system where nextflow itself is initiated. Currently local, sge and lsf executors are supported by DolphinNext to initiate nextflow. Apart from the executor of nextflow, you may change the executor of each job by using “Executor of Nextflow Jobs” option. If any option other than local and ignite, is selected, additional settings will be prompt for Queue, Memory(GB), CPU and Time(min.). Adjustment of these parameters are allowed for both options. For instance you may initiate nextflow in local and allow nextflow to run its jobs local, sge, lsf, slurm or ignite. Alternatively, selection both options to lsf or sge would allow both executions to be maintained by lsf or sge executor. In case of non-standart resources or settings is required for executor, then you can specify these parameters by using Other options box. For instance, to submit SGE job with 3 CPU by using paralel environments, you may enter -pe orte 3 (to use MPI for distributed-memory machines) or -pe smp 3 (to use OpenMP for shared-memory machines) in the Other options box and just leave the CPU box empty! Amazon Keys: AWS credentials that are saved in Amazon keys tab and will allow to start/stop Amazon EC2 instances. Instance Type: Amazon EC2 instance types that comprise varying combinations of CPU, memory, storage, and networking capacity (eg. m3.xlarge). Image Id: Virtual machine ID (eg. ami-032a33ebe57465518). If you want to create your own image, it should support singularity, docker engine (version 1.11 or higher), Apache Ignite, Cloud-init package, and Java runtime (version 8). Image has the directory to mount this storage. The output directory needs to be under this mount location. The storage system needs to be created in selected region and necessary rights need to be given in the console. Add EC2FullAccess and S3FullAccess permissions. Executor of Nextflow/Executor of Nextflow Jobs: Amazon instances are automatically configured to use the Ignite executors. Therefore, while defining amazon profile, you should select local for Executor of Nextflow and ignite for Executor of Nextflow Jobs.